Betaine HCl with Pepsin and MucoSave® can help to acidify the stomach, activate the digestive process, and soothe the stomach lining. MucoSave® is a patented combination of special extracts of prickly pear cactus (Opuntia ficus indica) and olive leaves (Olea europaea). As we age, normal gastric acid secretions are reduced. Individuals who have occasional heartburn may turn to medications designed for frequent heartburn sufferers, such as antacids and acid-blocker drugs. These can raise the pH in the stomach to reduce discomfort, but they also block the beneficial digestive effects of hydrochloric acid and pepsin. 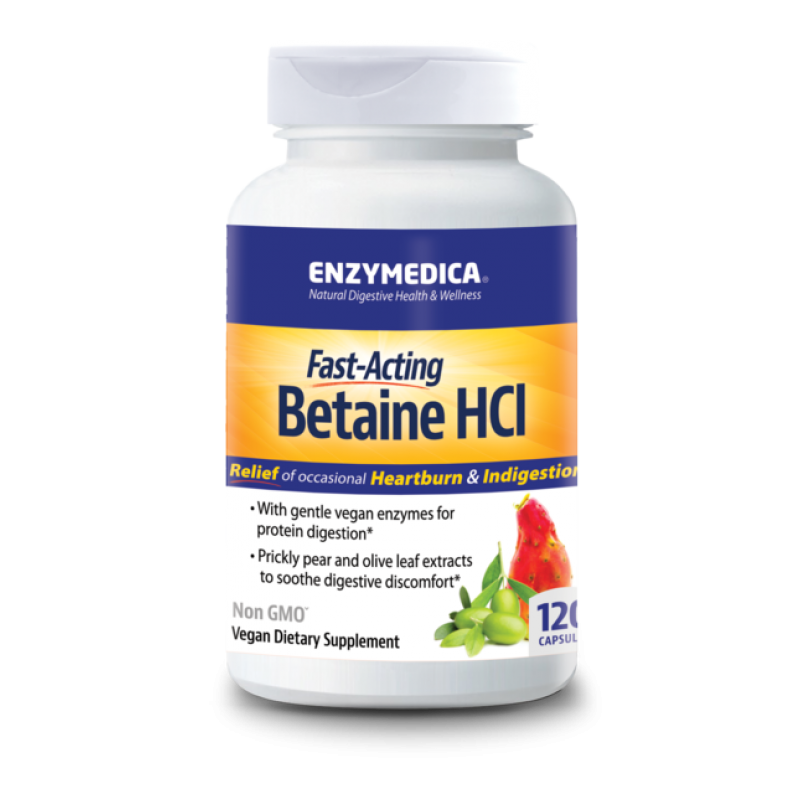 Enzymedica’s Betaine HCl has been formulated with a gentle potency of protein-digestive enzymes that will help aid the digestive process. * Hydrochloric acid (HCl) secretion aids in protein digestion, activates the protein-digesting enzyme pepsin, fights off the undesirable overgrowth of bacteria in the stomach and small intestine, and it encourages the flow of bile and pancreatic enzymes. HCl acid is important in nutrient absorption.